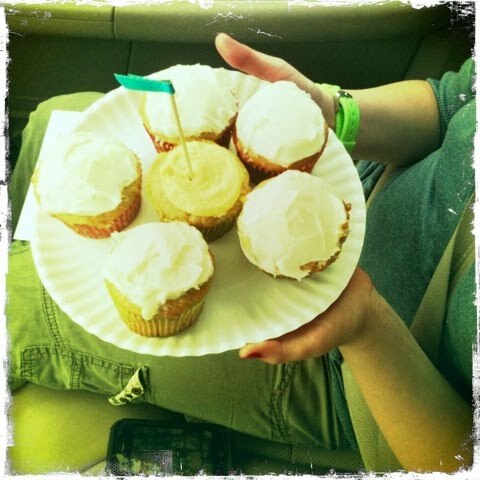 cardigans and kids: How about some banana cupcakes? How about some banana cupcakes? from "Baked: New Frontiers in Baking"
Line the muffin tin with cupcake liners. Preheat the oven to 325 F.
In a medium sized bowl, mix the dry ingredients together. Using your mixer, beat the butter and shortening on medium for 3 minutes. Alternating between the flour mixture and buttermilk, beginning and ending with the flour mixture, beat it into the batter. Scrape down the bowl, and beat another 10-15 seconds. Fill the muffin/cupcake liners 3/4's full. Bake for 20-25 minutes, rotating pans half way through. They are down when a toothpick inserted into the center comes out clean. The original recipe calls for a vanilla pastry cream - which is good - but I still ended up making my cream cheese frosting for them. *A very dear friend had a birthday. I have had this recipe bookmarked for about a year, but not enough reason to give it a go. However, a friend's birthday is always worth trying something new, especially when I know she likes banana cake and banana bread.